a Vet Lyte machine for electrolyte analysis. 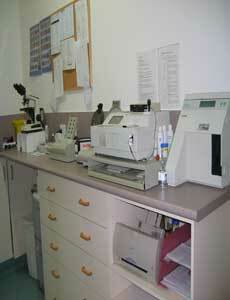 This allows us to perform routine blood tests in-house with results in as little as 10 minutes. We also examine all blood smears, swabs and needle-aspirates to assist in diagnosis. We use an external veterinary laboratory for tissue biopsies and specialised blood testing. Our record keeping system allows us to maintain permanent records of microscopy, pathology results and many other important data attached to the computerised files of your pets.